After so much of protests and agitation, finally the Maharashtra state government agrees to waive off the farmers’ loan. In an emergency meeting held on 11th June 2017, Sunday, the Maharashtra government decided to waive off the farmers’ loan. Before Maharashtra, it was Uttar Pradesh and Punjab where same kind of scheme has been declared by the state government. In recent times, Madhya Pradesh government has done the same thing. Now it is time for Maharashtra to take such decision. It was a lengthy meeting between farmer leaders and state authority about the same. A loan waiving scheme has launched on Sunday, 11th June 2017. 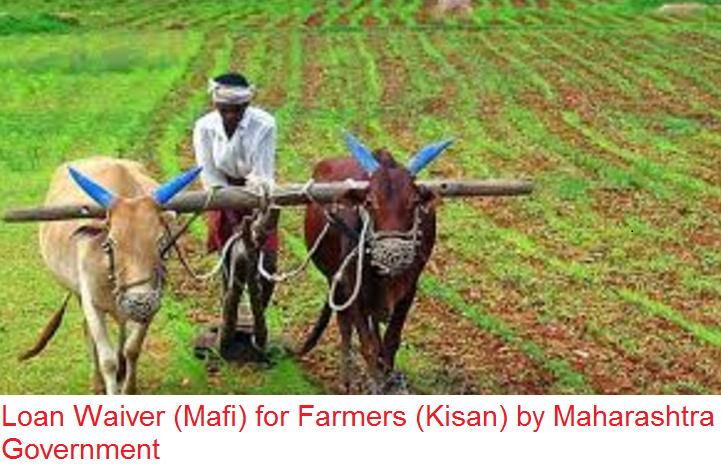 Under this scheme the farmers will get benefits of loan waiving and so on. Under this facility scheme, no businessman, political leader or service person will get benefits. Only farmers who are depending upon farming will be benefitted. Nearly 30,000 Cr will be invested in this scheme. A new committee will be formed soon regarding the same issue. The New committee will decide how and in what process the loan waives will be preceded. The committee meeting will be held on July 25th, 2017. For last one week farmers from all over the state were in protest. They wanted the loan to be waived off totally. In a meeting, the farmer leaders got assurance from the government that the loan will be waived off, though nothing is finalised as of now. The scheme will be applicable only for the small and medium farmers who don’t have other means of earning. For the other farmers who don’t fall under small or medium, the decision will be made later. Since a long time, farmers across the nation were showing their agitation in front of the government. The main reason for this protest is to waive off the farmers loan. Most of the small and medium farmers are dealing with heavy burden of farm loans which have become hardest to repay for them. Looking at current scenario in the country, many a states such as Punjab, Uttar Pradesh and Madhya Pradesh have started this scheme. For last 7 days, Maharashtra government is facing such protest and campaigning as well. Hence they have taken this decision. First of all the main aim for taking such decision is to make free the farmers from the heavy burden of loans. Most of the farmers are unable to pay them. Secondly the state government has decided to add some more facilities with the scheme to make the farmers better off. As of now the other facilities are not being decided. Also the committee that will be formed soon will look into the farmers’ various problems closely, so that their problems can be solved instantly. There will be 6 members in the committee. Senior minister of Shiv Sena, water resistance minister, agricultural minister, finance minister and cooperative minister will also be part of this committee. The committee will decide the next policies regarding the mentioned issue. The type and nature of loans to be waived off, the amount of loans, interest subsidy (if any), loan repayment process and timing and so on will be decided by the committee on July 25th. As of now the loan waived off scheme is enough to stop the protest. According to the farmer leader, the strike will be called off and also no more rally or protest will take place.